The green LED just above the secondary PCI Express x16 slot lights up when the power is supplied to the Asus P5N32-E SLI Plus. Keep that in mind when taking hardware out, or installing new components. 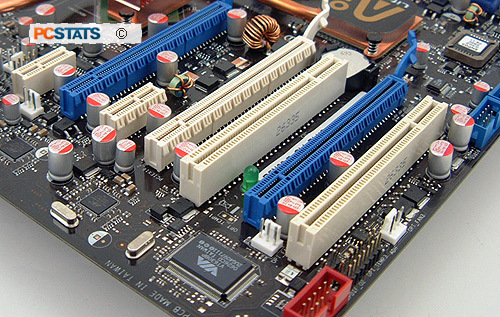 The white PCI Express x16 slot operates at PCI Express x8 speeds. The two blue PCI Express x16 slots operate with a full 16 lanes of PCIe each, and support nVidia SLI as you might expect. Peripheral expansion comes care of three PCI Express x16 slots, two PCI Express x1 slots, and two PCI slots. The upper most slot is proprietory for the audio card. All six of the Serial ATA II jacks on this board are mounted at a 90 degree angle along the very edge. 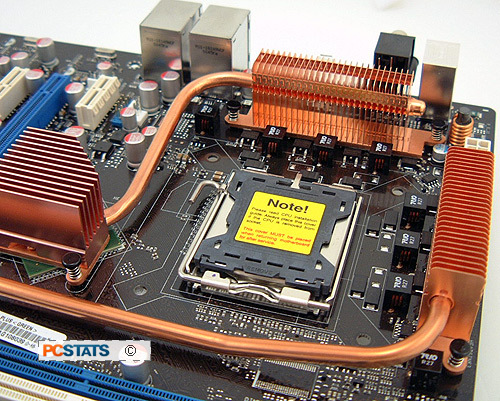 This keeps the SATA cables out of the way of onboard graphics cards, and other devices on the Asus P5N32-E SLI Plus motherboard. You'll definitely want to use this board with a full tower case so there is enough space to slot those SATA cables into position. 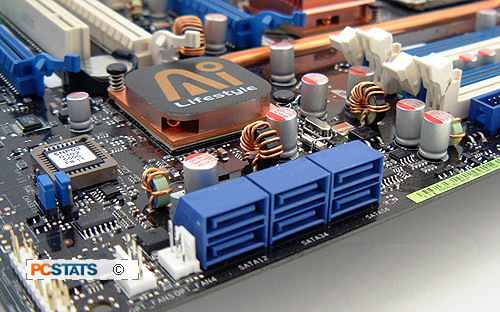 There are five separate fan headers on the Asus P5N32-E SLI Plus, something any enthusiast will appreciate. 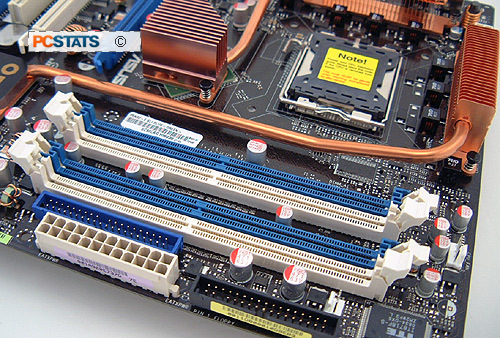 The 24 pin ATX, single IDE and single Floppy connectors are positioned to the right of the DDR2 DIMM slots on the Asus P5N32-E SLI Plus motherboard. Insert the DDR2 memory in alternating slots (same colour) to enable dual channel memory support. The board has only one IDE channel, so save this for optical drives (CD or DVD). 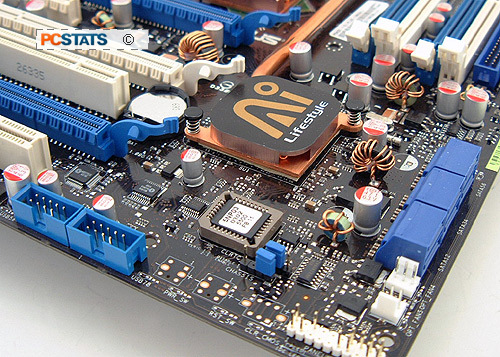 Space is a bit tighter around the LGA775 CPU socket on the Asus P5N32-E SLI Plus motherboard because of the two copper heatsinks on the adjoining MOSFETs. A 4-pin PWM fan header is positioned near to the CPU socket for the CPU heatsink and fan, it is also backwards compatible with 3-pin fan plugs if you are still using that style.